It has been quite an outburst of RC-related activity lately, which is as sure a sign as any that I am dealing with some serious personal issues; burying myself in projects like this might be the least-destructive way to cope with them. I have never had the luxury of three new kit builds on the go, and the Bruiser will be by far the largest and most involved of them. Those concerns aside, I can point to the Tamiya Bruiser in my possession and say that this is a long-held dream of mine, finally realized! My first Tamiya was a Toyota GT-One on the F103RS. It was a simple chassis that proved to be a good rookie car, if a bit difficult to find the ideal surface for it. I had always been interested in radio-controlled items and cars, so RC cars were a logical culmination. That car felt like a lifelong dream realized; playing video games was much more economically-feasible, and I had neither the money nor the support to treat radio-controlled cars as a real hobby. My childhood aspirations made do with the occasional cheap remote-controlled contraption, to be pitched when it broke after its inevitably-underwhelming performance. I could hardly complain, for I had the essentials covered in life, but I still fantasized about a true hobby-grade radio-controlled machine. Tamiya was even making the cars I saw in my video games – from Gran Turismo to 1:10 scale came the Castrol Celica ST205, the Calsonic Nissan Primera, the Castrol Mugen NSX – and the Toyota GT-One – all by the same company that produced the best static model I had built to that time (another story itself). My involvement in the hobby changed forever when I acquired a Buggy Champ as my second car; with it, I discovered the comparative freedom of off-road running, and nearly all of my acquisitions since have been all-terrain chassis. Along the way, I had been building my collection toward increasing mechanical complexity. I had always been interested in the mechanical aspect of machinery, and around the same time I purchased my Avante Black Special – then the most complicated build I would undertake – Tamiya re-released the Bruiser. It did not matter that I was not alive when the original Bruiser (or Avante, even) was available, for the concept of an all-metal, all-terrain truck with an actual shifting transmission was something that captured my imagination. At the time, I had saved up much of everything I had to acquire that Avante, but despite my good fortune that day, I still ended up wanting a Bruiser. If I were really increasing the mechanical complexity of my collection, the Bruiser seemed like a logical step, in the right direction, especially after the Avante. Instead, time and money (but mostly money) saw me take a different path with my cars, my desires for new challenges manifesting themselves in bodywork as opposed to chassis. I found out that the Avante was not what I envisioned; it had proven expensive to repair and limited in talent. Though Tamiya’s higher-end offerings certainly had my interest whenever they arrived, I probably never really wanted them as each new model slipped away without any further effort from me to acquire one. The Bruiser never totally left my consciousness, though. Eventually, I found that I was running out of spaces to run buggy-type off-road cars, and I was still intrigued by the sophistication of the 3-speed truck, especially as I learned more about automotive engineering. With classic models like the original 4 x 4 Hilux and Blazing Blazer reaching used-1:1-car prices, the Bruiser was the only affordable model until the Mountaineer re-emerged as the Mountain Rider. Even then, they were out of my grasp. It should be noted that the Tamiya Hilux High-Lift was also on the shelf that day at the hobby shop, yet neither that nor the Tundra nor the F-350 seemed to catch my imagination the way the Bruiser did. I passed it over completely. It was a trip to my local hobby shop for paints to complete my Ferrari 312T3 build when I finally decided I wanted a Bruiser, once and for all. It was likely triggered by the astonishing stock of Tamiya re-release models in the store: there – in the year 2019 – were new-in-box examples of the Novafox, Bigwig, Blackfoot, Egress(! ), Monster Beetle, and a Frog, perched high on a shelf behind the sales counter. Clearly, the employees there had an appreciation for classic Tamiyas, which was encouraging. “Do you still have the Bruiser in stock?” I saw one long ago, in another visit, and asked in the off-chance that maybe it was still kicking around. I never saw too many visitors in the shop, and the ones that were there either bought Redcats, Gundam models, or paints. “No,” he started, as my reasonable being sighed in relief, “but we can order one. You fill out a form, and we can have it in 48 hours.” My mind started racing, leaving my reasonable being in the dust. His reply shocked me. They had closed the gap – no, they had opened one up of their own! Even more shocking was learning that the upcoming re-re-release of the Mountaineer/Mountain Rider would be more expensive through the shop’s distributor, by $100 CAD, and not on pre-order. I had believed the Bruiser to be more complex somehow than its sibling, but this was completely secondary to the fact that a metal Tamiya 3-speed was now within reach! I would need to stretch, but within reach! “… I’ll think about it,” I said weakly, and continued searching for paints. I was nervous. Last time I was there, I was talking myself out of it by telling the shop owner about my Ferrari 312T3, and laughing that I needed to finish that before thinking about any new projects. I knew I would need to work hard to get that money back, particularly as unlike the 312T3, the Bruiser had been unplanned just a month ago. Yet it felt like I had been preparing for it for much of my life, and all my extracurricular interests had readied me for this moment. Even stranger was that the Hilux High-Lift that I was previously totally uninterested in was still there. It was going for even less than the Egress, and for that kind of money I could have it finished with full electronics – but no, I wanted a Bruiser! As if to firmly put my cards on the table: “I’ll pay for it in full.” What am I doing?! The shop owner started to smile. That definitely lifted his spirits, too! The trip home was an odd mix of elation and fear: I needed a third project like I needed to get hit by a truck, let alone a big, expensive truck that could be worth more than everything I was working on to that point. In my heart, though, I knew I made the right decision, and celebrated my ability to enjoy my hobby in a way I have never done previously. The rest is a short story: having ordered it on a Friday, it arrived on the Monday, and by Tuesday – stopping to retrieve it from the shop during my regular errands – I had it in my hands. Well, I had it in my arms, anyway: this box was massive! I had no idea just how large it was until I brought it home, and realized it was almost the width of the doorways in the house! When viewing box art for a kit online, it is easy to forget that the image is nearly the size of the box itself (though not true for some new releases with the “post-box-style” box front). In the case of the Bruiser, that means a large image indeed, and fine details really jump out at the viewer when looking at a box like this in person – this was the impression I was getting. Picture quality at this point was not great, mostly because I did not have a lot of time to take them before I had to find a place for it and continue on with my day. I have yet to even open the box! And then I had to set it aside. I can only wait so long, though! If you managed to read my lengthy story about how I got to wanting and finding a Bruiser, you would understand why I want to savour this build. I really wish I could go for the speed record, but I anticipate I will be putting in assemblies in a piecemeal fashion. Unlike previous projects, I do have all my supplies purchased at this preliminary stage, from electronics to paint to accessories. Hence, if deliveries are smooth, I should be able to make good time while still enjoying this build. That being said, I did read on this forum somewhere that one should not skimp on electronics for a Bruiser, and I am inclined to agree! That Axial ESC might make its way into the truck yet. I have yet to see a Tamiya 3-speed sporting a battery under 4 000 mAh capacity, and presently have no working batteries of that specification (maximum 3 000 mAh, and well-used), so it looks like there is in fact one more thing I need. I could get a proper-capacity battery while ordering another Axial ESC, I suppose! My Lancia 037 4WD-H has also taught me that too much complexity is possible in a model, so the emphasis will be on producing a running vehicle, though one with some attention paid to aesthetics. It is still not enough to convince me that I should use Stealth body mounts (it’s an RC car, and RC cars use body posts and clips – I can live with that), but enough for me to at least attempt to produce a neat paint job – the static modeller in me is still alive somewhere! Since I cannot afford a used vehicle, and therefore by association a classic Hilux 4 x 4, I have elected to pay tribute to it with a Czech-made custom step-side rear bed. Doing so means I will be unable to use the bed topper that is standard in the Bruiser kit, and I will need to do some drilling and cutting for this custom bed to fit the chassis. Roll bar options for the 122 mm width of the rear bed seem to be limited – thankfully, I have an assortment of styrene tubes and rods on the way, which could enable me to build one from scratch. The chassis will be stock – having a Bruiser is enough of a novelty for me to be happy with its stock performance for a little while. If I feel the need to upgrade, chances are I would find a higher-turn brushed motor for it first, and even then, that might suffice. Paint is at this point going to be mainly TS-43 Racing Green. If I elect for graphic accents, I will add stripes in TS-26 Pure White and TS-8 Italian Red, as an homage to my previous Avante Black Special and Astute hybrid – I had forgotten how popular those designs were when they made their debuts and feel that this combination could work on a truck like this. Even if it does not, it works for me! Going through literature, accounts, and reviews of the Bruiser, as well as the depth and breadth of custom projects involving the model, has made me realize that I know precious little about trucks and their culture. Knowledge at this point might be dangerous, since it could compel me to spend even more money on accessories (how about that K5 Blazer shell from RC4WD?! ), but anything I can learn about pickup trucks, show trucks, mud/bog racing trucks, and any combination thereof will be interesting to me. It feels a world removed from my regular research on rally racers, sports prototypes, and other genres, and it gives me something else to look forward to as I start this exciting RC adventure. It will be an awesome build experience I'm sure - thank you for taking us along with you! I'll echo that sentiment. While I'd never look down on anyone who buys the clone, its nice to see someone who lusted after the real-deal version go for it and make it a reality. I imagine its a very satisfying feeling. You'll find the Bruiser build to be pleasantly involved and rewarding. Tamiya at their finest. Fantastic!! I was shocked just how big the box was when I picked mine up! If you do get another ESC, the Hobbywing 1080 crawler esc is supposed to be phenomenal and they are $40 USD. Enjoy the build and take your time with it; there's plenty of winter left where you live! Thank you - I appreciate it This kit is certainly living up to its expectations so far, at the very least! Thank you for the recommendation! Hobbywing is a common name for good reason, it seems! I will have a look. The sense of occasion was marked by viewings of several Bruiser videos, namely the original promotional spot and a MatteoRC special! Those, along with several Tamiya R/C Line-Up entries, were enough to set the mood. Curiosity was quick to overtake that: I have never seen the inside of a Tamiya Bruiser box! What treasures await (besides a Tamiya Bruiser)? It is curious that despite my previous Avante Black Special, with its extensive use of blister packaging, it is only now that I understand the appeal of keeping kits new-in-box. It sure is beautiful in there – sure, there are plastic bags in the other half, but they are neatly-arranged plastic bags, and it definitely feels more high-end than the Ferrari 312T3 I have been working on. Of course, some of the feeling has to do with the sheer number of parts included, as we will see. If my build goes to my plan, the decals will remain mostly unused. That’s FIVE parts bags in there – big ones, too! The shift fork parts, clear parts, servo horns, transmission case, skid guard, motor, and tools really add to the heft. The tools are the ubiquitous 4-way box wrench, two small wrenches, and hex wrenches in 1.5 mm and 2.5 mm sizes. I did not pay too much attention to the fact that the re-release Bruiser had a black finish to the frame. The original/unpainted frame and re-release/painted frame scenario was the opposite of what I was expecting, and I found the finish on this kit’s chassis to be scuffed in several areas. No problem, though – the finish can always be touched up with black paint if surface deterioration becomes an issue. With everything in place, it was time to dig in! As mentioned previously, the first step is to add thread-lock to the existing screws on the semi-assembled chassis, and then add several more screws and a pair of flange nuts. Two damper bushings are also pushed into the central crossmember. Everything needed to be loosened again, which was mildly aggravating. Happily, it was the right thing to do, and every screw made it into the chassis cleanly. This is used for attaching the crank arm stay to the chassis. It seems I build by pouring out the parts in a tray/bin and picking them out as I go, a legacy of my days building with Lego. It is not a particularly efficient way, but one that is normal for me. For this build thread, however, I intend to continue laying out the required parts prior to each step as it remains practical. I was just over an hour into the build already at this point. Knowing how much the Bruiser means to me helped me deal with the challenges of the metal frame, and also gave me a broader appreciation for assembling kits. I found peace in even the most tedious of tasks, which was a good thing given that almost every screw also needed thread-lock! One and a half hours, and still only on Step 6. I love this build! The whole experience was taking me back to my Buggy Champ days, with the cast metal, metal gears, red thread lock, and cap screws. The textures and odours were certainly similar – that red thread lock is distinctive, and as always is tricky to keep off one’s hands. Also similar to the Buggy Champ was how smoothly everything rolled. For some reason, this was unexpected despite the abundance of ball bearings – perhaps it was due to the coarser finish of the cast-metal parts. I am used to fast-rolling cars being made largely of plastic, which is usually smooth; it is possible I associate that with the low friction these cars happened to also possess. It could also be because I never pictured the Bruiser to be a car that rolled quickly… I will not complain about the reduced drag on a heavy drivetrain, though! Oddly, Tamiya does not specify using the 5 mm grub screw for this axle until the next step. My time spent studying the electronic manual beforehand helped, since my kit was not issued with the supplementary note about flash on the front axle casting. The steering bound up in both directions, and recalling that note had me trimming the excess with a sharp knife right away. What an immersive build! Far from being discouraged, I am really having a wonderful time getting into this project and am happy that it may only get better with the leaf springs and transmission ahead. For now, this concludes today's build action. Just a heads up (you may know this already) Ibread on another Bruiser build thread here that it is a good idea not to press the bearings into the wheel hub bodies too far as this reduces the side to side play in the wheels when they are fitted to the axles. Will try and find it and a link. Here, its not the bearing its the plastic bush the bearing sits in doesnt need to be fully pressed in. Just a heads up (you may know this already) Ibread on another Bruiser build thread here that it is a good idea not to press the bearings into the wheel hub bodies too far as this reduces the side to side play in the wheels when they are fitted to the axles. Thank you for the advice - I had a look through the thread, and see exactly what you mean. I will be careful when I get there! The trick will be to get the finish of these lower legs on par with the rest of the driver figure. I anticipate this will require Tamiya Modelling Putty built up around two sections of the largest-diameter styrene tubing, visible on the left in the above photo. Why a 1:8 figure? This website dedicated to sci-fi modelling, in its discussion of driver/pilot figures, changed my thinking. If the writer’s hypothesis is correct, the Bruiser driver is in fact closer to 1:8 scale. I believe this, having considered stuffing one into a 1:10 Ferrari 312T3, only to find the figure required extensive hacking just to fit inside the cockpit. Off-topic: that Ferrari will be getting a modified 1:12 scale driver figure. We will see if this pans out! In the meantime, there seem to be more figure kits available in 1:8 scale instead of 1:10, and I did not have the heart to cut up a cheap pro-wrestling action figure. I wanted to be able to paint up a somewhat ordinary-looking passenger, and if that meant removing the lower legs, it would be easier to do to an unassembled kit than a completed, pre-painted figure. It remains to be seen if this plan will work. If not, then the easiest thing to do would be to drill another hole on the passenger side to install another 4 x 4 driver figure and do whatever remodelling necessary to get it to fit and differentiate it from the driver. Given my resources at this time, however, I see little reason not to give it a go! It will also be interesting to build an actual figure kit, which is something I have never done before – I have never even painted a full-body Wild Willy figure! On the mechanical side of things: I have now ordered a slipper clutch for the Bruiser gearbox. There is a good chance I will be building the transmission before it arrives, but I will see what happens. I also intend to try out the Axial AE-5L ESC, with the plan being to replace the battery connector with an extended Tamiya type (counterintuitive, but it extends the battery cable and brings it in compliance with the rest of my RC equipment – the Bruiser even features a battery cable extender, as we will see), and use the built-in LED output feature. If the LEDs can reach both front and rear from the ESC’s stock position in the mechanism box, the AE-5L will become the Bruiser’s; otherwise, I will either stick with the TBLE-02S or order a new, more truck-friendly ESC (I hear drag braking is vital). That comprises my thoughts on the build’s direction so far – if you are reading this without another post from me, I am either busy with Parts Bag B or writing up the next build thread entry! Parts Bag B concerns itself primarily with the suspension; hence, the damper bodies, damper oil, leaf springs, and suspension links among the hardware. This is where the axles will meet the chassis. What’s the problem? Each spring requires a 2 x 6 mm screw, and I picked the incorrect 2 x 4 mm type. I recorded this discovery below, after realizing that the screws I had selected were never going to thread into the nut to hold each spring together – that’s 6 mm on the left and 4 mm on the right! The contents of the tube were definitely aged, but with everything bolting together, it seemed the cement’s true purpose was to prevent the pieces in each subassembly from sliding around excessively. In this, the partially-cured chunks from the tube were still useful, and once built up, the axles showed no signs of shifting in place. A quick-curing or high-strength adhesive would have compromised my ability to align the axles appropriately, anyway. I did need all the help I could with this step, too – it was a struggle for me to even fit everything in the U-shaped bolts, let alone in the correct orientation. If there was a step I disliked so far, this would be the one! The manual specifies 6 mm of exposed axle between the outboard bearing location and the axle holder for the rear, and 7 mm for the front, which must be measured by ruler/caliper/etc. while this step is executed. Instead of attempting to do everything at once, it proved better to take care of each parameter as it came up in each stage of the assembly: ensure the U-shaped bolts are secured and everything is in the right orientation, check the axle spacing, tighten the bolts equally, repeat for the other side, and dial in the required position of the pinion. I suppose that here, as with every other step of this build, I just needed patience. I elected for slight caster on the front; without a fine protractor, I estimated it at 3 degrees, which I feel is still better than none. I can adjust it further at a later date to meet the manual’s prescription of 5 degrees, but am more concerned with getting the rear axle’s zero-degree setting correct! It should be mentioned that there is a system to ensure the correct setting for this, using a divot in the axle mounts to be lined up to scribed lines on the outboard bearing locations. However, my method of assembling the axles made this system difficult to use, and I ended up adjusting the angle using the pinion shaft as a guide against a level ruler’s built-in protractor. The absence of my dedicated protractor meant that I was limited to the 10-degree gradations on the ruler’s, and my estimates show my setting to be about a quarter of 10 degrees. I just wanted the whole thing built up by this point, and so was content with that, figuring I would only make things worse by attempting to get closer to 5 degrees! I must have gotten my 3-speed trucks confused, because I was initially at a loss to understand how to set the front caster, thinking there were special axle blocks I needed to insert. That is a step for the Hilux High-Lift, which of course is quite a different chassis. This is not the first time this has happened, either: I ordered a full set of ball bearings for the Bruiser, thinking the kit was issued with bushings, but again I was thinking of the Hilux High-Lift! Oh well; it is usually a good thing to have lots of spare bearings, especially if this Bruiser is to see plenty of driving. The threaded rod was assembled by the time I took this picture; I had mistakenly attempted to use the longer of the two in Parts Bag B, and quickly amended this error – so quickly, that I missed taking the photo of its constituent parts. Hopefully the idea is clear, though! The large spacers sit in the leaf spring loops, fixed by the long screws and 3 mm lock nuts to the leaf spring shackles, while two smaller screws, spacers, and black O-rings are there to secure the suspension links to the chassis rails. The rod will link the steering arm on the left front upright to the crank arm stay on the chassis. It was all I had time for today, unfortunately. The dampers and wheel hubs are next, to complete both the suspension and Parts Bag B. Parts Bag C will be the exciting one, but the remaining steps for this bag will have me building a new (to me) type of damper, so I will be looking forward to it! Edit: * As I will find out later, it seems the low-profile 3 mm nuts are there to leave room for the skid guard to bolt onto the chassis via the U-shaped bolts' threads. Interesting! Looks nice. I can see why so many people admire the Bruiser given all that metal in it's construction. And I am lucky enough to reaffirm the difference first-hand! The kit comes with one bottle of oil for the dampers, but I brought out the second one from my inventory in an effort to finish it off before starting the new bottle. I have never built this style of damper until now. It looked like a lot of parts, but a lot of parts that worked together to simplify the operation and consistency of the damper performance. The issue in question was a report of excessive lateral play in the axle due to the bearing holders being pushed too deep into each hub. I had attempted to press them in partway, but ultimately pushed too hard. It was already tricky just to ensure the holders seated properly in each hub. However, I believe I now understand why that holder and a 1680 bearing are used instead of a 2280 bearing (which does fit): serviceability. Flipping the hubs once or twice saw the bearings slip out of the holders – it means more care is required in handling them off the truck, but this is a non-issue once the hubs are on the axles, since they are held in place by the axle housing. The holes in each hub are stamped ‘R’ and have a slotted opening – from my earlier manual comparisons, I learned that the re-release uses the front right hub casting from the original for all four wheels. The original had different left and right front hubs, with the left having a round hole, and the right having the slot. It had to do with driving the front wheels in first gear, since reversing them prevented this from happening in the original. The re-release does away with this, using the distinctive casting for all four wheels and notching the axles to match. With this design, I can tighten the nut down until it stops, which is when the spacer underneath comes in contact with the flange nut on the damper shaft. Great! The guard’s attachment to the chassis on the U-shaped bolts’ exposed threads is visible here. I put the rear axle upside down! As the axle housing is asymmetrical, this puts the pinion shaft on the wrong side of the chassis; the driveshaft from the transmission will either never reach the rear axle, or will bind up terminally in so doing. I described it as a big mistake because correcting it meant revisiting the leaf spring attachment steps, which I did not particularly enjoy. I had to reapply the ancient Goop (though I was now getting into the fresher, uncured contents), realign the axle, and retighten the nuts on the U-shaped bolts. Fortunately, I was already experienced, and having the leaf springs on the truck already certainly helped. Edit: Yet for some reason, the photo accompanying my inverted-axle revelation shows it the correct side up - I must have used the "after" picture instead! I did a double-take and then a double-check, and it looks like the axle is presently on the right way. 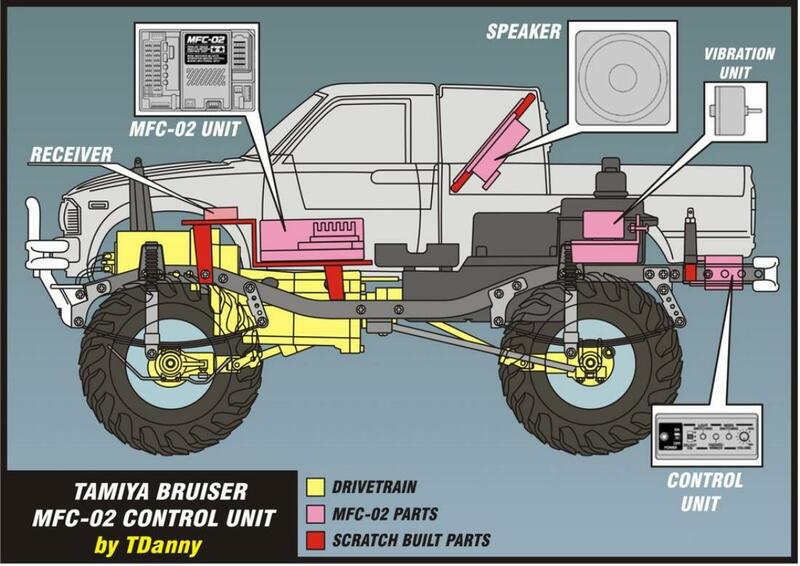 It's nice the Bruiser kit has you build the transmission and axles. RC4WD's Trailfinder TF2 kit comes with the transmission and axles already built; I think that subtracts some of the fun in building these types of vehicles. If you've ever built a medium or large Lego Technics kit (or for us old guys, the preceding Expert Builder series), then a lot of the fun came from building the mechanisms and just handling them and playing with them independently. The differentials in this build are pretty interesting since they don't use the typical bevel gears. I'm looking forward to seeing how the transmission goes together. So want one, too much right now, still building Top Force. Have a truggy brasher waiting to be done and already thinking about the build after. Really been bitten by the RC bug. What, really, RC4WD? I have to agree with you completely on that sentiment - building gears ranks high on my personal list of favourite kit building steps! There is a measure of pride in getting them all meshing and turning smoothly, too. The choice of planetary differentials, if I am to believe the Tamiya Avante promotional spots, would be for their compact dimensions compared to a bevel-gear type - useful for fitting inside that relatively-small axle housing. The two models' differentials are similar, though the Avante uses two planet gears per sun gear as opposed to the Bruiser's three. A Bruiser build is something that must be done at least once. Hope you can make the space for it! The 3-speed transmission is one of the Bruiser’s most definitive features, providing a true working scale version of an automotive component. Therein lies much of the Bruiser’s appeal: a shifting transmission, combined with all-metal frame construction and real leaf-sprung live axles, give it not just the feel, but some of the performance of the full-size trucks in the 1980s. I had an entire episode about the seeming counterintuition of linking a multi-speed transmission to a motor whose torque is available almost instantaneously, before remembering that even wind turbines use gearboxes to adjust their output in different conditions. If I am to drive this truck like I want to, I will be needing the various ratios that this transmission has on offer! The transmission shafts are kept separate from the other parts in the same bag this way. The precise nature of these gearboxes might have something to do with this, given how any nicks or burrs on these shafts could impair and then critically damage the gears in operation. But then, I had trouble grasping the concept of a multi-speed transmission with an electric motor, so what do I know? What I learned, though, is that one of those bags is an extra set of gears and shifting fork inserts for maintenance purposes. I appreciated it. One would think it was made for that! That would be part of the magic of assembling kits – once everything was in place, the purpose of their locations and arrangements would become clear. With the slightly-embarrassing stumble out of the way, I was ready to turn my attention to the other gears. But was I ready to tackle the main shaft and its system of shift hubs and rings? I had to be – it was the next step! Why is it a ‘dog gear?’ I did not know this myself, and still do not know the etymology. I did learn, though, that ‘dogs’ refer to the large protuberances on the shift hubs’ outer circumferences. In a ‘dog box’ transmission, these ‘dogs’ engage with opposing surfaces inside a gear to engage it, but in the Bruiser, it looks like they engage the shift rings instead. The main and counter shafts, through the positioning of their gears and the system of cross-pinned and free-spinning shift hubs, permit different gear combinations to be engaged, and thus different speeds/ratios. Already, it looks like a serious bit of kit. Shift forks are next! I wish I could say I understood everything about how the Bruiser’s 3-speed transmission works. In the course of this build, I cannot claim that, even if I am definitely more enlightened than before I opened the box. While I understand the principles that make it operate, I cannot really remember which combinations of those principles appear in precisely what areas of the gearbox - if only Tamiya released a clear version of the Bruiser's gearbox casing! The mighty-again Mabuchi RS-540SH, with that proud sticker, is the motor around which the re-release Bruiser’s gearbox was designed. The original used that starter-box-size RS-750SH; at that time, the extra size was needed to turn what was then a primarily metal-geared transmission on a 6 V or 7.2 V nickel-cadmium battery. I can only assume that as electronics improved, the designers at Tamiya realized that a plastic-gear transmission could be rotated by a conventional 540 brushed motor. With that kind of attitude around motor choice, I was surprised to learn that the re-release gearbox makes provisions for different pinion sizes; the motor mount has one round screw hole and one slot, to permit mesh adjustments. The kit-supplied pinion is a 19T type, but this discovery could allow me to fit a steel 20T pinion from my stock if I felt so inclined (having no steel 19T pinion on hand). It was necessary, too, as the gearbox’s configuration prevented me from eyeing the mesh as well. Visual inspection had served me well on my F1 and touring-car chassis to this point. The only problem with dry-cell testing was that the gearbox appeared to spin smoothly, without many problems for the motor, even at the tightest mesh. It took a few tries to listen for and find the ideal setting. It was at this step that I understood one reason why the propeller joints were telescoping: installing the complete transmission would have been exceedingly difficult without that feature! One troubling fact is that the gearbox refused to turn during the dry cell test in this configuration. I am not keen on pushing it further yet, since I suspect the shift fork got pushed to a position that prevents the gears from engaging cleanly. Even if I am incorrect, the idea of not forcing non-rotating gears to turn is good practice. Radio gear awaits – I do not have my 4-channel radio yet, but have a plan to test everything out anyway with my current 3-channel setup… As much fun as building the transmission has been, I look forward to putting it in motion! Fantastic work and great documentation of it. It must be good because I had never really quite 'got' this model before but I'm starting to appreciate it. The planetary gear arrangement in the transmission is pretty interesting; I didn't realize that was part of the model. My CR01 has a similar planetary gear setup; I wonder if the plastic gears are the same? yeah i agree with you matteo does make a video. and tbh he is to blame for my buying my bruiser after i saw hi bruiser in the mountins video. i use a bbq wooden skewer for the threadlock as you can get it into the holes/nut threads easy if not that then try a tooth pick. I studied the manuals at this suggestion, and while the planetary gear layouts are similar between the Bruiser and the CR-01, the CR-01's planetary gears look wider, and no other component seems to match up between the two kits. Good tips - and thanks for posting the picture of the slipper clutch! That gave me a better idea of where it goes in the gearbox; I have edited my build thread accordingly, having previously thought it to be a replacement for the spur gear. The entirety of this bag will finish off the chassis, with only the bodywork left. The first steps associated with this parts bag, though, will only entail checking the radio gear. I had planned to use (and ordered) the renowned Futaba 4YWD Attack radio and receiver, in the 2.4 GHz version. Part of the fascination I had with the kit was the use of a real H-style shift gate on a twin-stick radio, to row through the gears like on an actual truck. That radio has yet to appear, though, and there have been plenty of instances of Tamiya 3-speeed trucks being operated with 3-channel radio equipment. A Spektrum DX3C is exactly what I had, despite never needing more than two channels for any of my radio-controlled cars. The ESC will be close to the rear end of the chassis in its usual mechanism box position. This looks like it will do! Axial issues this ESC with another 4-LED string, which would be useful for the headlights and a pair of auxiliary lights, but I doubted that would be long enough for what I could have planned. Having two working headlights would be enough for me; the auxiliary lights can be revisited later with either accessory buckets or a separate lighting kit. As the Axial ESC has a Deans connector, compatibility with all my Tamiya connectors in the batteries and chargers I own was a small matter of plugging in a Deans female – Tamiya male connector. This had the bonus of extending the battery cable to a usable length. The ESC’s rearward location means that an extension is required to reach the Bruiser’s stock battery location, but instead of the kit-issued Tamiya female – Tamiya male type, I can use this one instead. While the Spektrum servo was intended for another build, I think I will have the generic 6-kg servos by the time that build starts, and the Bruiser can definitely benefit from a stronger servo! As previously mentioned, I will not be using the battery cable extension, but will make good use of the motor cable extensions. Hardware pieces, the front body mount, cable ties, and rubber bands for the battery tray round out the contents. The Traxxas 2056 is rated for around 2 kg of torque, while the Spektrum S605 is rated for 9 kg. I had previously believed at least 4 kg was needed for both shifting and steering servos, but also heard that a well-maintained transmission can use any standard servo. If that is true, 2 kg should be sufficient for shifting, but I can rest easy with the 9 kg unit steering the front end. The corner of the sheet closest to the corner of the mechanism box had to be trimmed in order to fit the box lid. It was not extensive; a millimetre was sufficient. This is definitely not weather-resistant, with plenty of daylight appearing through around the edges when I fixed it to the box. However, the electronics section is the highest point of the mechanism box, so anything short of submerging the vehicle should be fine for the electronics. My choice of equipment also means that everything in there but the receiver is waterproof, so there is not much harm to be done in the first place. Sure, losing the receiver would be particularly bad, but I do not intend to go deep-river diving in this rig! Where they are, the electronics should fare well, with waterproofing being purely precautionary. The Spektrum S605 has seen its first and last of my projects. The metal servo horn seemed to fit neither the Tamiya – Futaba nor the Sanwa – Acoms – KO servo saver adaptor, despite being advertised as having a 23T horn. That should have had it fit the Sanwa – Acoms – KO servo piece, but no such luck – eventually, I forced the 25T Tamiya - Futaba part onto the servo horn, with little prospect of removal. Meanwhile, the same part slid cleanly onto the Traxxas 2056! Besides torque rating and the metal horn, there is little to distinguish this servo from any other better-regarded servo I have used in the past. The shifting servo saver is radically cut away for clearance purposes; without the trimming, the corner of the servo saver would contact the shifting servo saver. I might have clipped too much, especially with the presence of thread-lock on the ball connector nut (it threads onto a 3 x 8 mm screw). A variety of servo horn screws are issued with the kit. The Traxxas 2056 servo worked with a 3 x 10 mm tapping screw, while I used a 3 x 8 mm machine screw for the Spektrum S605. Even I had seen the top-mounted on/off switch in the back of the Bruiser’s pickup bed. Here’s the thing, though: the Axial AE-5L does not have an on/off switch! I am mildly impressed that I totally ignored this fact until now; I must have really taken it for granted. This is the first ESC I have seen without one, and I am a bit uncomfortable with having the model on as soon as I connect the battery and having to disconnect the battery just to turn it off. I hope its performance is that much better than the TBLE-02S! In the scheme of this build, lights are more important than an on/off switch, but I really don’t know what I miss until it’s not there anymore… Can I say I was looking forward to having an accessible switch? I was close to wishing for another way, since I found it quite difficult to line up the screws and O-rings to the matching holes in the mechanism box. Compounding the issue was the fact that all four screws were machine-type, so more revolutions were needed to secure them. The manual advised against over-tightening them, but it was not that straightforward to figure out what was sufficient. I ended up pulling at the box to check for slack once the screws were in; after tightening them, I loosened them until I could pull the mechanism box slightly off the chassis, at which point I re-tightened them until I was sure the O-rings took up all the space between the box and the chassis. … I think I liked the well nuts on the Buggy Champ better! At least I was not building the original, though, which called for putting in the servo access hatch from under the chassis! I had forgotten an earlier comment about the Bruiser’s gearbox: the gears shift better in motion. All the balkiness of the shifter at rest (I guess I thought I needed to do that to adjust endpoints on the servo) disappeared as the gears spun fluidly on the throttle, from one ratio to the next. Part of me regrets jumping ahead to a 3-channel setup, because it turned out to be great fun shifting the gears at the flick of an auxiliary switch. I set my Spektrum DX3C to a 3-position auxiliary switch near the throttle-hand thumb, and while the switch’s throw was minimal, it felt like an ideal position. It was satisfying enough for me to wonder why I ordered a separate 4-channel radio… I do intend to enjoy H-gate-style shifting once it does arrive, nonetheless – in the meantime, I can be confident that the truck is set up correctly. The front and rear LEDs are routed out this way, too. I did have to put the rear lights opposite the other cables in order to reach the rear of the chassis; those are the cables trailing out to the right. I have to say that this is enough for me to try out the 3 000 mAh batteries first, before considering anything new. Where else do these wheels appear? I am dubious of their inclusion, since elastic bands never age well, but at least they are easy to replace! This marks the final step for completing the chassis.